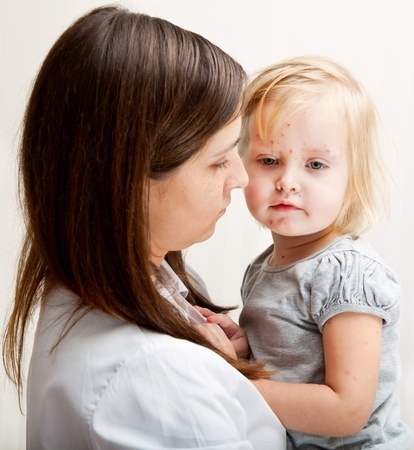 In 2013 the typical yearly number of measles cases more than doubled from 60 to 189, prompting a concern that the measles epidemic in the United Kingdom infecting more than 1,400 children is spreading to the United States. According to the Centers for Disease Control, this recent outbreak is the largest since 2000 with 28% of the cases bringing the measles from other countries and infecting unvaccinated people in the United States. The cause for the outbreak is thought to be related to the false claims that the MMR vaccine causes autism, which put fear into parents about immunizations and has resulted in many childhood diseases inflicting children who have not received the recommended vaccines. A 2013 outbreak in Texas is directly linked to a Dallas area church whose leadership opposed vaccinating children. Recently I interviewed Dr. Marisol Fernandez, a specialist in the field of pediatric infectious disease about the MMR vaccine and parent’s concerns about it’s relationship to autism as a part of my WebTalk Radio series, Pediatric Health Facts. You can listen to the audio podcast on this page. The MMR vaccine concerns childhood diseases; measles, mumps and rubella. The reason we picked this subject is because the MMR vaccine is in the news again because of the dramtic increase of measles cases reported in the United Kingdom it’s rise in the U.S.
Dr. Marisol Fernandez is a specialist in infectious disease and received her medical degree in Venezuela from The University of Venezuela. She did her pediatric training in Austin, Texas and did her fellowship in Pediatric Infectious Diseases at Baylor College of Medicine.She is back in Austin with a Multi Specialty Group at the Dell Children’s Hospital after working in Missouri for over three years. Dr. K: Some parents today don’t even see children with measles, mumps and rubella. So why are we still vaccinating for these diseases? Dr. F: The vaccine has been so effective we have seen a decrease of these diseases. Many of our parents and the population don’t remember seeing people and their family with these diseases. People who had measles remember the complications that ranged from fever, red eyes, and cough that would develop into pneumonia, lung infection and involvement of the brain and death. Even though we don’t see many cases they still occur, even in the United States. Continuation of the vaccine is very important and critical to keep these potential diseases under control. Dr. K: We don’t have a vaccine for the common cold and roseola and those are diseases that we get sick from every year. Why do we develop vaccines for some and for other diseases we let the disease run its course? Dr. F: We do not have vaccines for many infections. We wish we did have a vaccine to prevent and decrease the diseases and the complications associated with them. Vaccines against roseola and the common cold, those infections although quite common, are much less likely to cause life threatening complications. In the development of these vaccines that affect these infections, it is taken into account the effect and the complications that the infection can cause and then how easy it is, based on either the bacteria or the virus, to invent a vaccine that would be effective enough to prevent the disease. Dr. K: I know there are experts monitoring common diseases and evaluating what each disease is costing. Are we doing better and what are the side effects that parents are worried about? Are there organizations that monitors these vaccines and what is happening with them? Dr. F: On the national and international level there are organizations to monitor for not only the incidents of the illness, but the incident of the illness after the vaccine has been administered and complications of the vaccine. There are numerous websites where parents can see the side effects of the vaccines or report a concern of a side effect from the vaccine. Among the websites available are The Center for Disease Control and Prevention, it is a wonderful place to look for reliable information on side effects of vaccines. There also is the Vaccine Adverse Event Reporting System that has been in charge of recording adverse vaccine reactions. A few years ago there was an adverse reaction to a vaccine and after the vaccine was administered and the information was gathered changes were made. We know the system works and the websites can be viewed by all parents. Dr. K: We can go to these websites and see all the information regarding the vaccines and make an informed decision before visiting the doctor? Dr. F: Yes, there is very detailed information and it can help parents to prepare questions before coming to the office and it enables them to have an open and honest conversation. On the website for the Center for Disease Control and Prevention, www.cdc.gov , you can find a links to the Vaccine Adverse Event Reporting System on our website. Dr. K: If the MMR vaccine is so effective why do we need more than one injection of the vaccine? Dr. F: We know that 95% of children that received the first dose of MMR develop antibodies, proteins that will give them protection if they are exposed. To increase protection from 98% to 99%, a second dose is recommended between the age of four to six. It is effective but there is a small percentage of children that might not respond to one dose. Dr. K: What about Autism? I am sure you have heard the concerns from parents regarding the association between MMR and Autism. Do you see any childhood issues and how are we doing on reporting on these problems and the investigations of them? Dr. F: When you look at the side effects from the MMR vaccine, the most likely neurologic side effect from the vaccine is a febrile seizure, and after that there is no neurological involvement and there is no autism that will develop after a febrile seizure. The concern comes from some data published in the late 1990’s about a linkage between autism and MMR vaccine. However, this has not been proven. Articles have been written looking into this data. An article was published in 2004 and recently in 2013 to see if there is an association and that data has not been proven. Further research needs to be done as we do not have strong data connecting autism and MMR vaccine. Dr. K: I was recently reading an article by an economist referring to something entirely different. Apparently when the cause of polio was being investigated they were trying to link ice cream and polio because of the sales and consumption of ice cream and the increased incidents of polio. I thought it was very interesting how we make a cause and effect relationship when it is not there, but we have an obligation to investigate. The MMR vaccine was in the news again when the Wall Street Journal published a very extensive report in July 2013 about some 2000 cases of measles in the United Kingdom. Dr. F: The relationship is probably due to the lack of immunization of children. There was a cause and effect when the news came out about a possible relation between autism and MMR, and the delaying of parents having their children vaccinated or did not have them vaccinated at all. Now we have a large population that does not have immunity to provide protection and that creates a perfect scenario for countries that don’t have immunization. When a person travels in those countries and get exposed to someone that has not been vaccinated cases of measles appear and increase. In the United States in the late 1980’s and early 1990’s measles increased because of the low number of preschool children vaccinated. I think in the United States there are more unreported cases. People that travel outside the United States get exposed to the virus and return home to children that aren’t vaccinated. They then come in contact with friends and neighbors and if any of those people are not vaccinated the disease passes on and more people are exposed. Dr. K: We are talking about very contagious diseases. It is very easy to spread the measles, mumps and rubella. Dr. F: That is right, once your are exposed to the measles and if your child is not vaccinated they can get the disease after one single point of exposure. That is one very good reason for the administration to push that all children be vaccinated. Parents tell us they don’t travel and their children don’t travel, but they do come in contact with people in the neighborhood, churches, shops, their friends and elsewhere. Dr. K: You mentioned earlier about febrile seizure in regards to side effects with MMR. Can you explain how common they are or how dangerous and does it happen often? Dr. F: It was one of the side effects reported from MMR. IF the child has a family history of seizures then that child is twice as likely to have a seizure. It is a scary thing to see your child have a seizure. They usually happens when the fever starts going up and then once the child recovers long term effects from complications and brain damage can occur. The measle virus can go to the brain and cause brain damage. Dr. K: When people get vaccinated they sometimes say they feel funny. Adults can tell you when they don’t feel right, but children can’t. Why do we feel funny sometimes after receiving a vaccine? Dr. F: After getting the vaccine there is some pain associated with the injection site and you can also have a low grade fever. That funny feeling is probably the immune system reacting to the process of making the antibodies. But after a few days those symptoms will usually go away. Dr. K: Some parents want to know if you can get the disease from the vaccine because it is a live virus. Dr. F: We hear that question quite often. You will not get the virus from the vaccine and not from the MMR vaccine. Of course, everyone is different. Most children that receive the MMR vaccine have normal immune systems which work perfectly fine and they do not get the disease from the vaccine. Children with compromised immune systems should not receive the vaccine. It is a live virus and if your immune system is not working properly then you can get the disease. Dr.K: What is the immediate risk of not immunizing an infant? Sometimes the parents want the child to be exposed to the disease as a way of building their immunity. Dr. F: It is increasing the risk for your child to have the disease from which they can have severe complications. We come across that idea from well intended parents They want them to have diseases like the chicken pox and get it over with. We had a well educated set of good parents that wanted to expose all three (3) of their children. One (1) of their children was exposed to the disease and developed encephalitis and died. The parents then did decide to go ahead and have the other children immunized. We need to really emphasize the need for vaccinations as children can die from childhood diseases. Dr. K: Some parents have ask about a practice called “sick parties”. This was done when these disease were more prevalent. Is this a safe practice? Dr. F: The suspected cases we have had recently have either resulted from someone who has traveled overseas and were in contact with someone that was in the incubation period. A big risk comes from children that are adopted overseas where immunization is not optimal. Those children come from countries that have endemic diseases. They can look fine for twelve to twenty four hours, come back into the United States and then become ill and pass the illness on. The disease is out there and we have to be aware of that. Dr. K: Do you recommend that children who are adopted from other countries start from the beginning with immunization? Dr. F: If their vaccinations have come from a country that has questionable immunizations you can always draw a blood sample to see if they have any amount of antibodies in their system. If they have no antibodies in their system then you know that they need immunizations. Dr. K: If a pregnant woman was not immunized as a child what are the risks for her unborn child: What can happen to the unborn child if the mother is suffering from measles during her pregnancy? Dr. F: I think if a young female becomes pregnant and is not immunized and comes in contact with someone who has measles or mumps it can cause an abortion, but the most critical disease is rubella in the MMR vaccine. If the mother is not immunized against rubella and gets exposed the baby can be affected the rest of its life with blindness, deafness, heart disease, developmental delay or mental retardation. We don’t see it often, but when it could have been prevented by immunization we need to really communicate with parents in order to do what is best for the children. The most important is to keep the line of communication open between the parents and the pediatrician and stress the importance of their children being immunized.